Main course is the concert, performed by violinist Emmy Storms (known from, among others, Podium Witteman) and singer Annelies Storms. 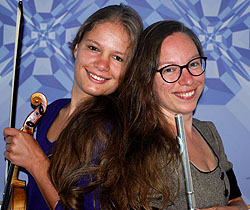 With great passion both sisters – music academy educated - bring a musical program that connects classical and contemporary, as well as folk music from different countries. And what about the connection between Bach and Ireland ?! Two inspiring short films by Louis Spoelstra (filmmaker and former teacher at the film academy and former head of art academy) visualize the theme in a creative, imaginative way. Especially for this evening Theo Hakkert (writer and columnist) wrote a short, striking reflection, which he also recites himself. Like previous editions, Ida Roekevisch (painter, colourist) exhibits her latest, impressive oil paintings, on which she portrays 'connection' in artistic ways. Finally, Ellis Frans-Kapma exhibits a number of paintings from her multifaceted collection, which also take up the theme of the evening. As in previous times, all guests are offered a drink during the break and afterwards. The intimate, atmospheric church, halfway between Borculo and Eibergen, seats up to 150 visitors and is open from 7 pm on Saturday evening November 10. The program starts at 7:30 pm and lasts until about 10 pm. Due to subsidies, the entrance fee is only 7.50 euros all in. Subscribe to info@idaroekevisch.com or info@frans-kapma-foundation.com.